This space wallpaper showcases the ancient globular cluster 47 Tucanae, a dense swarm of up to a million stars. The image at left shows the entire cluster, which measures about 120 light-years across. This space wallpaper showcases the ancient globular cluster 47 Tucanae, a dense swarm of up to a million stars. 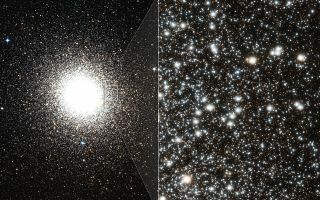 The image at left shows the entire cluster, which measures about 120 light-years across. Located in the southern constellation Tucana, the cluster is about 16,700 light-years away. The right image captures close-up views of thousands of cluster stars. The large, bright stars in the image are red giants. These stars have puffed up to several times their normal size because they have exhausted their nuclear fuel and are near the end of their lives. This image was released July 18, 2013.